Overtaking other vehicles can be hazardous, particularly on high-speed, two-way roads. If you misjudge the gap needed to overtake safely you could collide head-on with an oncoming vehicle. Head-on crashes are usually very severe because of the high impact speeds typically involved with two sets of occupants. If a car hits an oncoming truck moving at similar speed, the impact is similar to the car hitting a rigid wall at twice the speed! You also need enough space to avoid colliding with the vehicle that you are overtaking. Selecting safe gaps for overtaking is a key hazard perception skill that takes time and practice to develop. Overtaking is similar to, but not the same as passing other vehicles on multi-laned highways, freeways or arterial roads. It is much harder and far more dangerous. When overtaking on a two-way road you need to cross the centreline and travel on the 'wrong' side of the road. The decision to overtake or not overtake another vehicle is mainly your own. Most of the time you overtake to maintain the speed at which you want to travel. However, sometimes you will need to overtake or pass stationary or broken down vehicles. The best thing to remember about overtaking is not to do it unless you really have to. the power/acceleration capacity of the car you are driving. The best approach is for you to learn what a safe overtaking gap looks like for you and your car. To achieve this you will need to work your way through the following practice exercises. You will notice that the practice exercises start with passing other vehicles on multi-laned roads such as freeways or divided roads. This is to ease you into the gap selection skills required for overtaking and minimise the risk to you and other road users. Remember, if you don't feel confident about overtaking or feel that it would be unsafe, don't do it. Find a road in a 60, 70 or 80km/hour speed zone with two lanes in each direction, but no median strip. Try to find one that has several kilometres of fairly straight road where you can easily see approaching traffic. A street directory may be useful in finding a section of road like this. In fine weather and in daylight, go to this section of road. Try to avoid peak times as the traffic is likely to be moving slowly. Drive in the left lane and start to come up behind a vehicle that is travelling below the speed limit. Move up to a 3 second following distance behind the slower vehicle. When it is safe, indicate and move to the right hand lane, pass the slower vehicle then indicate and return to the left lane in front of the vehicle. Leave a safe gap between your car and the vehicle you have passed. Practise timing how long it takes to perform this passing task on the multi-laned road until you can consistently estimate your passing time. Practise passing vehicles of different sizes, particularly trucks - time this in the same way as you did for passing cars. You will find that it takes you much longer to pass. When it is safe, travel at the speed limit on the same multi-laned road, (in daylight and good weather) and select an oncoming vehicle . By counting, "one thousand and one" and so on, work out how long it takes for that vehicle to draw level with and pass your car. The task is shown in the picture below. Once you have tried this several times, select several more oncoming vehicles and estimate how long it will take for them to reach your car. Then count "one thousand and one, one thousand and two" and so on, and compare your estimate with the actual number of seconds counted. Practise this until you can consistently estimate how long it will take an oncoming vehicle to reach you, within one second accuracy. You have now practised separately the two main parts of overtaking. It is now time to combine them to simulate what it would be like to overtake a vehicle on a two-way road with oncoming traffic. From Step One, you know how long it takes for you to pass a slower vehicle in a particular speed zone. For example, if it took 12 seconds from when you first indicated until you moved back to the left lane, then 12 seconds is the minimum time that you need to overtake a vehicle travelling at that speed in that speed zone. Using this example, you need to add a safety margin of at least 3 seconds to give you the minimum time gap you need between your car and an oncoming vehicle if you want to overtake a slower vehicle in this speed zone on a two-way, undivided road. The two components of a safe overtaking gap are shown in the picture. Now work out what your estimate of the minimum safe time gap would be for you to overtake safely by taking the passing time you have already worked out in Step One and adding a margin of 3 seconds. Use the same road that you have practised Steps One and Two on. Drive in the left lane and start coming up behind a vehicle that is travelling at just below the speed limit. Move up to a 3 second following distance behind the slower vehicle. Watch the approaching traffic and look for a time gap that you think would be large enough for you to safely pass the slower vehicle before the approaching vehicle draws level with your car. Pull out, pass the vehicle and return to the left lane. Check your estimate against your actual performance. Did you manage to complete the passing task before the approaching vehicle was within 3 seconds of your car? Practise this task until you can consistently identify a safe time gap between your car and an approaching vehicle and complete the simulated overtaking task with at least 3 seconds to spare. The skills that you have learned and applied in Steps One-Three can be applied to other speed zones. You may wish to practice these steps on a divided 100km/hour road to ensure that you have got a good grasp of gap selection for safe overtaking. What you have learned can also be applied to overtaking on narrower two-way, undivided roads in built-up and rural areas. However, there is less margin for error on these roads. That is, you are in more danger if you make a mistake. If you have not overtaken on a two-way undivided road before, you may want to observe a more experienced driver that you trust do this first. 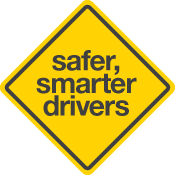 The best two-way, undivided roads to practise overtaking on are quieter roads in 60km zones. It is also best to use roads that are broader than local, suburban streets. 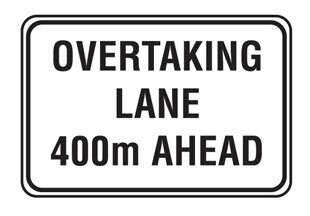 Use these overtaking lanes to pass slower traffic. It's safer and avoids the risk of a head-on crash.